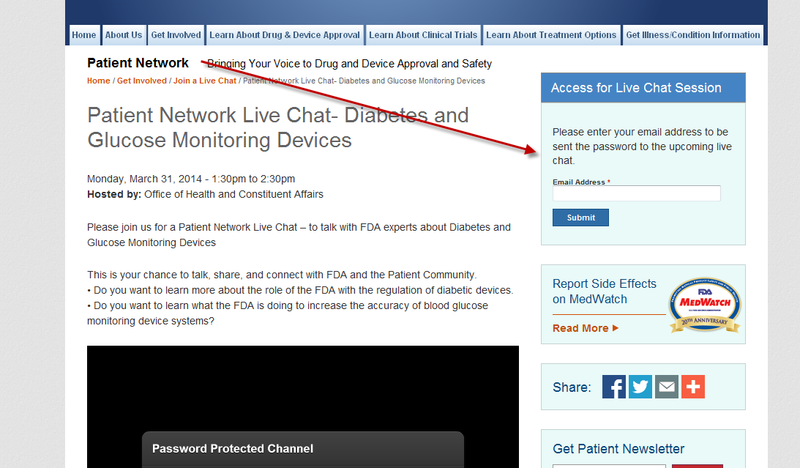 Please join us for a Patient Network Live Chat! Do you want to learn more about the role of the FDA in the regulation of medical devices, such as glucose meters and test strips, used in the management of diabetes? Do you want to learn what the FDA is doing to increase the accuracy of blood glucose monitors and test strips? Enjoy an informal, open discussion with a fellow patient advocate, CDRH subject-matter-expert and others in the diabetes community. Learn more about the role of the Center for Devices and Radiological Health, specifically the Office of In Vitro Diagnostics and its work to ensure the safety and effectiveness of medical devices used in the management of diabetes. Get your questions answered about the newest FDA draft guidances, which are proposing new recommendations intended to improve the accuracy and safe use of blood glucose monitoring test systems, giving health care providers and people with diabetes better tools to manage blood glucose levels. Whether you want to just listen to the interview to get informed, ask relevant questions to better understand the medical device regulatory process or just speak your mind on the newest draft guidance document…. you should join in the conversation. Mark your calendars and be sure to join us on March 31st, 2014. I thought the webinar was very useful. Thanks for your leadership on this issue. As a long-term T1 (46 of my 56 years) this issue is one that affects my life on an hourly basis. An opportunity to affect the FDA requirements for meter accuracy is a critical one and your efforts are very much appreciated. I hope those of us who need one will soon be able to access hospital-grade meters. Bugs me that there are two different standards. The mortality rate and statistics for hypoglycemia do not equate to two different standards for hospital in-patient vs home use. Thanks for joining. Please send FDA these comments. We have samples you can cut and past if you want. Very happy to hear it was useful for you. Congratulations on the decades of success.